Issue #3: Nurturing the newbies - Ork Manager: Coal & Top hats by Goblinsama Ltd.
9 days ago by Goblinsama Ltd.
You may or may not be aware that this devlog aims to alternate posts regarding the past, the present, and the future… if you aren’t, follow the above links! 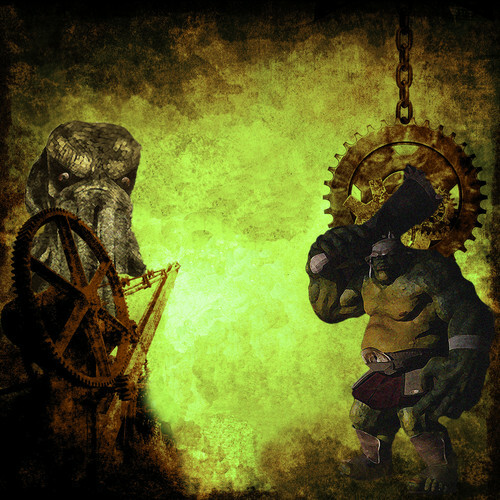 Ork Manager is designed to accommodate all levels of players, from the seasoned veteran to the bewildered newbie. Sorting the Teams in different divisions, according to their rank, proved to be quite effective when the Teams are in sufficient numbers. However, during the first seasons of this alpha, we only have access to a limited number of testers, and some late‑comers are struggling to compete against the 2nd or even 3rd Teams of other Users. The receiving Team will be stronger. The Brawler will play instead of just staying there twiddling his thumbs, and when he will finally come back he will hopefully have gained some experience, i.e. he will be stronger. Veteran Users might have too many Brawlers collecting dust, not strong enough to be used, not valuable enough to be sold. They might not want to sell them anyway, they’d just want them to grow stronger. Newbies don’t have enough supporters to create their own Brawlers, or enough gold to buy them, but they would need them. Getting them through a loan will allow their Team to perform better, thus accumulating new supporters, gaining more gold, a better rank… and they need all those. It’s a risk, but the very same risk would have occurred even if the Owner would have fielded him in one of her Teams. The Owner might decide to charge the receiving Team an amount of gold in exchange for this loan. This might make sense in case she considers the “getting injured” risk too high in comparison to the reward of the Brawler returning stronger than before. Finally, not being able to use that Brawler in case of emergency might be worth some gold. Now… how much gold? Newbies don’t have much! It’s a free market, we’ll see; I suspect it will only be a nominal amount in most cases. It doesn’t make much sense to loan them for longer periods, since the receiving Team’s situation might have changed, and the Owner might wish to re‑evaluate. Shorter loans might be too powerful, and would oddly distort the Game. That’s why there won’t be a “dismiss loaned Brawler” button. This feature has an immediate consequence: Users are now able to almost freely trade gold. That’s easy: if you want to pay me, I can offer you a worthless Brawler in exchange for the amount of gold you owed me, and that’s it. If this wasn’t acceptable, the entire feature would have to be scrapped, or re‑designed in such a way that it wouldn’t have this problem. But, luckily… it is acceptable! Being able to trade gold has always been among the “future features” to be implemented someday, so if you use a loan in order to transfer gold, it’s not a big deal. Keep in mind that the loans will likely be in Shiny Gold only, so if you planned to trade Dirty Gold or Liquid Gold, you are out of luck. I don’t know if they’ll ever be tradable. Also, the loan transaction will be public, for everyone to see – that’s mostly in order to deter any shady use of this feature, whatever that may be (given enough Users and popularity, someone always finds a way to do something nasty). When a loan comes to its end, the involved Brawler ends up in the Owner’s “free Brawlers” pool, i.e. not assigned to a specific Team – able to be assigned to any. In order to start a loan, the Owner visits the target Team’s page, selects one of her free Brawlers, and picks a price; the Team’s Owner will have to accept or decline the offer. Removing a Brawler from a Team has a cost, that’s why you are only able to loan out free Brawlers, otherwise at the end of the loan they would have ended up in the free pool, bypassing the “removing from a Team” fee. The other reason is practical: the list would have been too large otherwise. Users might abuse this feature, spamming too many unsolicited loan offers, maybe even with unreasonable prices, hoping for them to be mistakenly accepted. This is likely one of the next features to be developed, but has to be started from scratch, and might be absolutely non‑trivial. This means it will be analysed quite soon, but we don’t have a completion estimate yet. PS: always keep in mind, for this and for any other future post, that there’s no guarantee that things will go as planned. The Cthulings embrace change, and the Dwarflings might decide to scrap anything.